Blurb Description: One stormy summer night, Olive and her best friend, Rose, begin to lose things. It starts with simple items like hair clips and jewellery, but soon it’s clear that Rose has lost something bigger; something she won’t talk about. When they discover the ancient spellbook, full of hand-inked charms to conjure back lost things, they realise it might be their chance to set everything right. Unless it’s leading them towards secrets that were never meant to be found . .
I’ve never seen Magical Realism done better in a young adult novel. 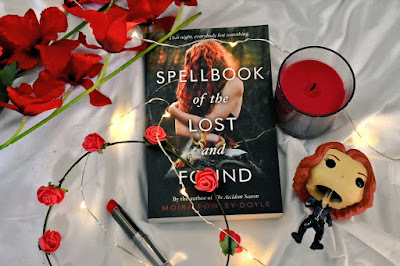 Spellbook of the Lost and Found was on my bookish radar (that truly shows testament to my VERY GREAT BRAIN* because I can actually remember things when it comes to ALL BOOKS that are on my VERY VERY LARGE bookish radar) long before I received a copy of the book, or even actually started reading it. *The Very Great Brain is an instrument of remembering that works in some situations like remembering how many books I want, but not in other situations like the size of my already existing TBR. 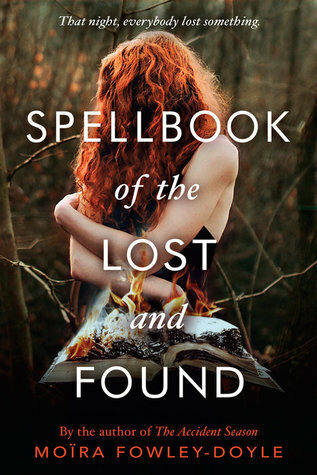 When my overwhelming TBR gave me permission to flip open Spellbook of the Lost and Found, this MYSTERIOUS AND MAGICAL MARVEL entranced me with its soulful writing, magical realism and brilliant characters making itself one of the BEST books I’ve read in 2017. “What will you let go of? What can you not afford to lose? It may not be for you to choose. This is my first book by Moira Fowley Doyle and her writing had me STUNNED. It managed to pull me into the story in a tiny magical town where things kept getting lost, into the story of nine teenagers who cast a spell to find lost things. Doyle’s writing had me stuck in her world, unable to move despite everything going on around me and I LOVED EVERY MINUTE OF IT. I don’t really know how to separate the two in this book but WOW this was one well plotted book with an idea to match. Spellbook of the Lost and Found made me fall in LOVE with the idea of magical realism, its simplicity and brilliance and I so badly wanted to jump into the book and live in it. Written from three girls’ points of view (Olive, Hazel and Laurel), this book shows you different sides to the story and eventually connects it all. The writing and the plot complemented each other perfectly. I love how everyday things were turned into something magical and that this book also managed to have some INSANE plot twists. SUCH A GOOD BOOK. I LOVED OLIVE, ROSE, ROWAN, IVY AND HAZEL. It took me a little while to get used to Laurel, Ash and Holly but I did and by the end of the book I fell in love with them too. I think two of my favourite characters were Olivia and Rose and the amazing friendship they had between them. Both of their dialogue and personalities were brilliantly portrayed and I felt like we got to know them more that any of the other characters. If you’re a fan of mystical writing, a strange and magical plot and beautifully written characters, Spellbook of the Lost and Found is THE book for you. Utterly mystical and magical, this book will have you looking for magic in everyday happenings and leave you completely spellbound. Moïra Fowley-Doyle is half-French, half-Irish and lives in Dublin with her husband, two daughters and two cats. Moïra's French half likes red wine and dark books in which everybody dies. Her Irish half likes tea and happy endings. Moïra spent several years at university studying vampires in young adult fiction before concentrating on writing young adult fiction with no vampires in it whatsoever. She wrote her first novel at the age of eight, when she was told that if she wrote a story about spiders she wouldn't be afraid of them any more. Moïra is still afraid of spiders, but has never stopped writing stories. Have you read Spellbook Of The Lost And Found or The Accident Season? What did you think of them? If you read both, which one did you like better? What is your opinion on magical realism? What are some of the best books that you've read that have magical realism?